Our next stop was a campsite called Otitotongwe, or more commonly referred to as Cheetah Park. It was hot and dry and desert-like at the campsite, which was perfect for drying all our wet belongings. At 4:00 it was time to see the cheetahs. Cheetah park actually has 4 cheetahs that are tame enough to play with. You can touch them, play tug of war, cuddle them, whatever you’d like! 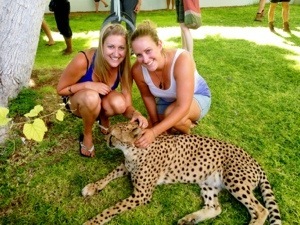 We were overly enthusiastic (as we are about most everything here) about petting the cheetahs. Gina especially had been waiting for this day since Vic Falls, and it was finally upon us. 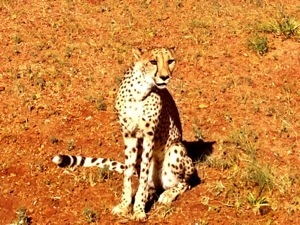 It was unbelievable to pull up to the reserve and see cheetah’s just wandering around with people. At first we were all a little uneasy about how or where to pet them. We had rules like “don’t wear sunglasses” and “don’t touch their feet or tails” but otherwise we were free to romp around on the grass with them! There were three cheetahs that were a couple years old, and one cheetah that was only 8 months. You could tell he was the baby of the group. He had softer fur, tufts of fuzzy hair around his head, and had the energy if a kitten on catnip. He zoomed around the yard, tugging on people’s loose clothing, stealing hats, and playing tug of war with anyone who would join. At one point he ran over to me and started chewing down on my ankle. His mouth fit around the entire thing as he tried to detach my foot from the rest of my leg. 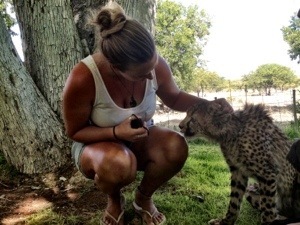 Attacked by a cheetah in Africa? Check! When playtime was over, we drove off to the next part of the reserve. This area is where rehabilitated cheetahs are slowly introduced back into the wild. They have a few hectares of land to live on and hunt as they please, but once a day a truck drives through the area to feed them. The cheetahs clearly know that the truck means food. As soon as we drove down the road, the first cheetah came running towards us. The driver got out, while we all stood in the truck’s trailer and took photos. The guy took a stick to ward off the cheetah, then used it to spear a giant hunk of meat. 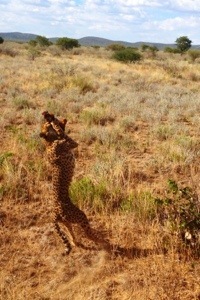 Instead of letting the cheetah chew the meat off the stick, he flung it in the air for the cheetah to catch. As soon as he did, the cheetah sprinted off to eat the meat alone. 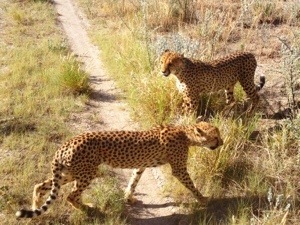 We carried on, and before long there were three more cheetahs running towards us. We fed all three of them in similar fashion then moved on to the next ones. 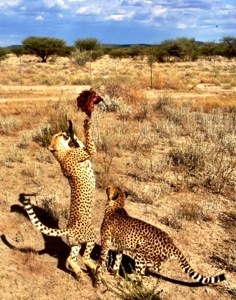 We fed 9 cheetahs all together and then finally drove back to camp. What an exciting afternoon! 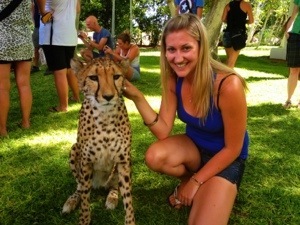 This entry was posted in Africa, Namibia and tagged Cheetah park, Otitotongwe, Travel by hilarylust. Bookmark the permalink.